The private consumption grew 0.74% during the quarter, compared to 0.46% for the previous quarter. This might not be strong enough to be convinced with the recovery, but we can at least observe the economy is not catastrophically hurt. However, if we see more in detail, the consumption of households grew 0.71%, whilst the figure without imputed rents is 0.62%. This implies low interest rates brought by the quantitative easing are supporting the figure, and the real consumption is slightly weaker. Investment shows the influence of the QE even more clearly. Residential investment accelerated from -3.31% for the previous quarter to 5.73%, whilst non-residential investment sank from 1.45% to -0.08%. Japanese companies obviously seem to hesitate to make further investment as personal consumption is not sufficiently strong. Although the Japanese government urges industries to invest further, it is naturally a horrible idea to invest when there is a deflationary force in the economy. Deflation means too much supply, and then if a company tried to build more factories to supply more, it would obviously result in loosing money. Meanwhile, the significant recovery of the residential investment shows the QE is working on the property market, while the rest of the economy is still struggling. Exports and imports both accelerated steadily. Exports grew 3.01% compared to 1.96% in the previous quarter, whilst imports grew 1.60% compared to 0.96% in the previous quarter. This trend will continue as long as the yen is devalued. 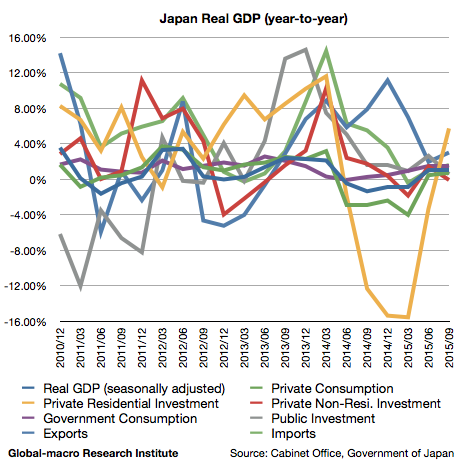 As we observed in the consumption and the investment, the Japanese economy is suffering from the consumption tax hike, although it is also supported by the BoJ’s QE. As the writer was pessimistic about the Japanese economy, the growth of 1.08% was personally a positive surprise. If the depreciation of the yen continues, and the financial markets do not collapse, Japan might show a decent growth in 2016, but the next consumption tax hike in 2017 will ruin everything again. Hereafter, Japan and the US both have their own reason why the economy cannot grow rapidly, and therefore it would be difficult for the stock markets to go up without a reason but financial easing. However, there will not be financial easing in the US, so the investors should consider whether or not the Japanese stocks can go up without a bull market in the US stocks. A slowdown is the issue all over the world.